Microsoft’s Windows Phone 7 OS ships with an integrated Bing Maps client, but Bing’s map data is lacking in many parts of the world. Unfortunately Google does not have a maps client for Windows Phone 7 yet, so some WP7 users are stuck between a rock and a hard place. 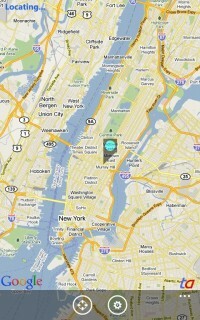 We’ve come up with (the start of) a solution: TechAutos Maps is a basic Google Maps client for Windows Phone 7. It’s meant as a temporary solution until Google releases its official app (hopefully soon), and is still missing lots of features (POI search, favorites, etc. ), but some users might find it useful even in its current shape. TA Maps must be side-loaded (i.e. not from the Marketplace), so it requires unlocking your WP7 phone (see instructions).